This is my fourth Red Racer variety from the Central City Brewing Company. I've got to say that the quality of all these canned beers has been high - outstanding in some cases. So, my hopes are high for this one. This beer has a deep yellow colour - not completely pale. Perhaps it's that Mariss Otter barley giving it some character, colour-wise. There was an average, creamy white head on it that lowered slowly to just a film on top. The lacing starts out solid and clears / vanishes on the way down. The smell - which I could pick up at arms' length when I opened it, is nice & hoppy. It's mainly citrus, with some slight evergreen, and a bit of malty, slightly toffee-like sweetness. It's kind of like a toned-down version of their IPA's scent in most aspects. I find the flavour a bit mixed up. Don't get me wrong - it's a tasty beer. But, to me, it tastes a bit like a pale ale that is perhaps too much like a lighter version of their IPA (not necessarily a bad thing, since it's so good), and a bit too much malt? I don't know. It just seems to be a bit out of sync. The citrus is strong in the taste, especially a peel / rind taste at the end of the sip, near the back/sides of the tongue. Some honey, and maybe some grasses, too. The finish is a bit sticky, and bitter (but not overly so). Overall, a good beer that I think could use a bit more balance. 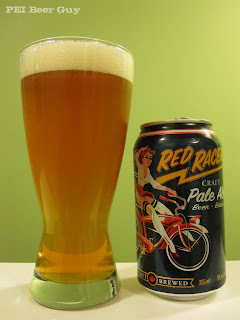 Definitely worth a try, but this pale ale does "pale" or blend in with too many other hoppy beers I have had, particularly from Lagunitas, or Red Racer's own fantastic IPA.